Table saws are one of the most important tools in any shop. If you have the luxury of a medium to large workshop the you can benefit from a large stationary table saw. 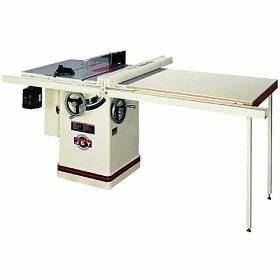 Large stationary table saws provide extra horsepower and a larger work surface. These two benefits improve precision and safety. The following four stationary table saws are the top selling models on the market. 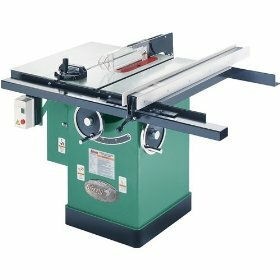 A powerful 1-1/2-horsepower motor combined with rugged construction and 50-inch Accu-Fence system make the Artisan 10-inch table saw the premier table saw for the contractor, craftsman, or home hobbyist. Other features include the T-slot miter gauge, which increases accuracy and flexibility in stock width capabilities, and solid cast-iron extension wings, providing ruggedness for increased accuracy and longevity. The unitized wiring system is readily removed for portability. Shown with optional mobile base. The Powermatic 1791228K is available for $1,099.99 from Amazon with FREE shipping. The DELTA 36-L51X-BC50 10-inch left tilt 5-horsepower cabinet saw can handle any job you throw at it without any problems thanks to a powerful 5-horsepower motor that makes it a perfect fit in a high-performance shop. This left-tilt version of the famous DELTA Unisaw has a computer-designed motor cover, a miter gauge, standard insert, and a 4-inch dust connector that will fit most common vacuums. Included is a commercial-grade 50-inch Biesemeyer fence system with adjustable steel support legs, as well as a carbide-tipped blade, cast iron extension wings. The table is 27-by-76-inches long. It is backed by a 5-year warranty. The DELTA 36-L51X-BC50 is available for $2,386.42 with FREE shipping from Amazon. 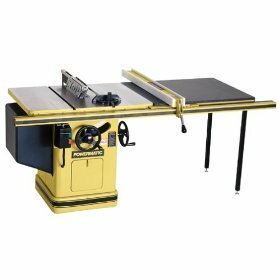 Built with the same heavy steel cabinet and cast iron table as the extremely popular Model G1023S, this left-tilting saw became an instant hit when introduced last year. Just as with the G1023S, the motor is 3HP, single-phase, 220V and has a triple-belt pulley. The blade splitter has been redesigned from that of the G1023S for even easier adjustments, and the accurate and dependable Shop Fox Classic fence also comes as standard equipment. The Grizzly G1023SL is for $1,075.00 from Amazon. 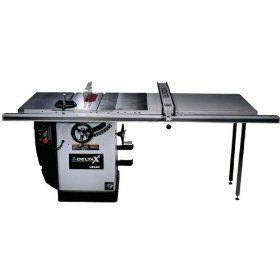 10″ XACTA SAW Left Tilting Arbor Tablesaw with Left tilting blade for greater accuracy and safety. Choice of 3 HP, single phase; 5 HP, single or three phase. Comes standard with the XACTA FENCE II 30″ or 50″ Commercial. Both fences also offer a 12″ rip capacity to the left of the blade. Large precision-ground 27″ x 40″ cast iron table with two extension wings. Reinforced steel enclosed cabinet. Built-in slanted cabinet floor leading toward the standard 4″ steel dust port. Convenient front left rail-mounted magnetic on/off switch. Chrome-plated handwheels. Hinged steel motor cover. Totally enclosed, fan-cooled motor. Wide stance trunnion design to eliminate vibration and insure perfect blade alignment. Three matched v-belts mounted between the two arbor bearings for longer bearing life and greater stability. T-slotted table with precision mitre gauge. See-through blade guard with splitter and anti-kickback pawls. One-piece precision ground arbor. Standard Equipment XACTA FENCE II Precision fence system. Mitre gauge Blade guard/splitter. Cast iron extension wings. Cabinet-style stand. Dust port Blade not included. XACTA-LIFT All JTAS-10 Kits are available with the XACTA-LIFT router insert and deluxe fence built in. The JET 708663PK JTAS-10XL50-W1 is available for $1,799.99 with FREE shipping from Amazon.